"In 2009, the tiny island nation #Palau (population 21,000) prohibited commercial shark fishing in its 230,000 square miles of ocean territory, creating the world's first shark sanctuary. Palau's president, Tommy Remengesau Jr., boiled this decision down to simple economics, noting that sharks are a big draw for undersea sightseers. Alive, an individual shark is worth more than $170,000 annually in tourism dollars, he said, or nearly $2 million over its lifetime. Dead, each can go for a hundred dollars — and usually, that money winds up in a foreign poacher's pockets. 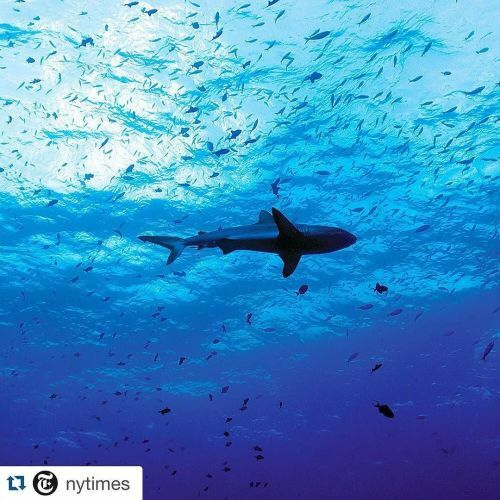 The @gettyreportage photographer @benlowy captured this reef #shark swimming in Palau's protected waters while on #nytassignment for @nytmag. Visit the link in our profile to read more about how Palau has mounted an aggressive response to illegal fishing." By benlowy on Instagram.